Life cycle. An infected female Anopheles mosquito inoculates sporozoites into the human during a blood meal. 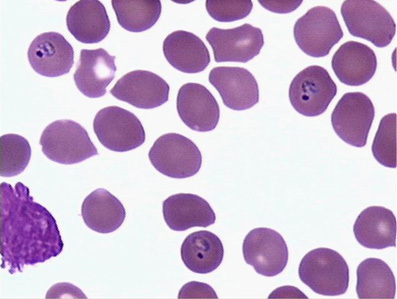 Sporozoites infect liver cells and mature into schizonts, which release merozoites (exo-erythrocytic schizogony). 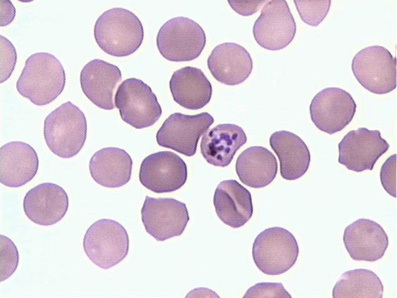 The merozoites infect red blood cells. 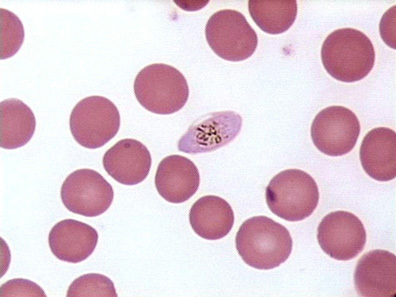 The ring stage trophozoites mature into schizonts, which rupture releasing merozoites (erythrocytic schizogony). 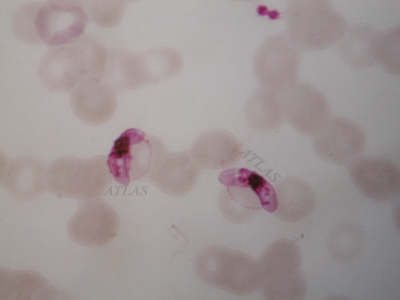 Some parasites differentiate into sexual erythrocytic stages (gametocytes). 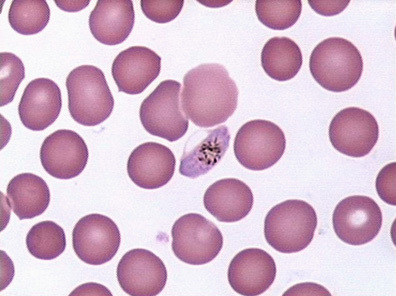 The gametocytes are ingested by an Anopheles mosquito during a blood meal. The microgametes penetrate the macrogametes generating zygotes in the stomach. 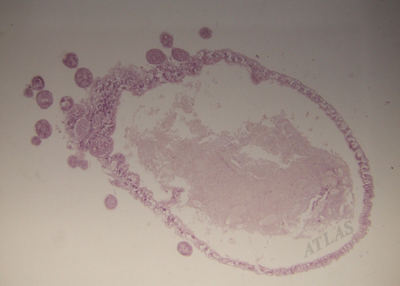 The zygotes become ookinetes and invade the midgut wall where they develop into oocysts. 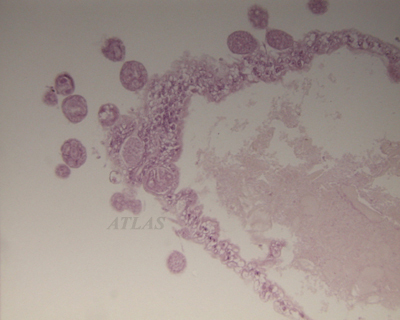 The oocysts release sporozoites, which make their way to the mosquito's salivary glands (sporogonic cycle). Morphology. 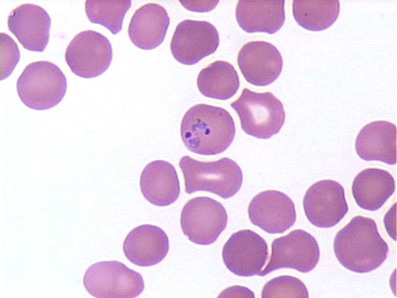 Ring: delicate cytoplasm; 1 to 2 small chromatin dots. 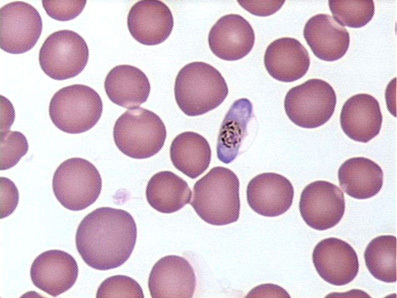 Trophozoite: seldom seen in peripheral blood; compact cytoplasm. 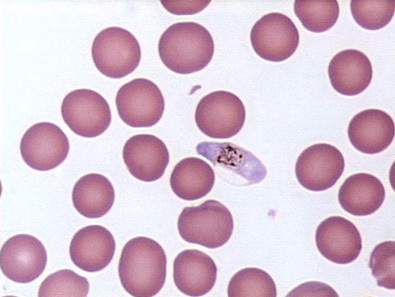 Schizont: seldom seen in peripheral blood; mature = 8 to 24 small merozoites. 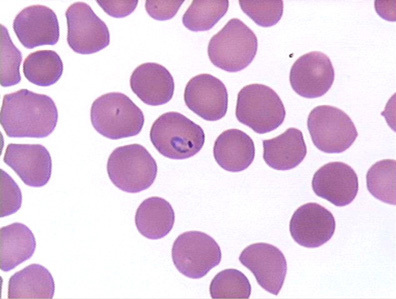 Gametocyte: crescent or sausage shape. Pathogenesis and clinical symptoms. 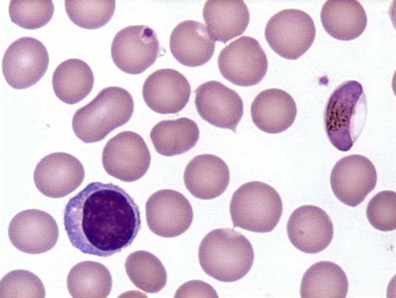 The disease is caused by the direct effects of red cell invasion and destruction by the asexual parasite and the host's reaction. 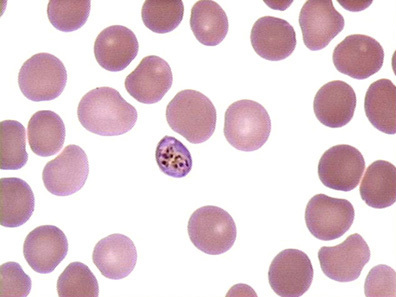 The symptoms of uncomplicated malaria can be rather non-specific. The most frequent symptoms include fever and chills, which can be accompanied by headache, myalgias, arthralgias, weakness, vomiting, and diarrhea. 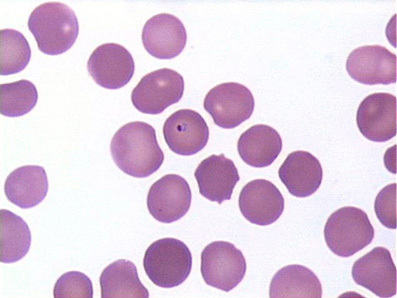 Other clinical features include splenomegaly, anemia, and thrombocytopenia. 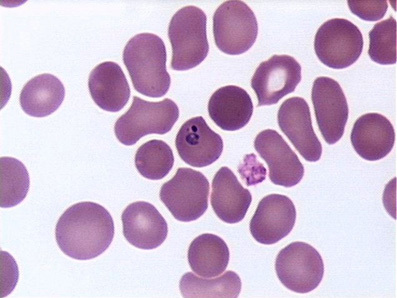 In P. falciparum infections, membrane protuberances appear on the erythrocyte's surface, which make the erythrocytes stick inside the small blood vessels and uninfected red cells. These processes cause obstructions of capillaries and venules. 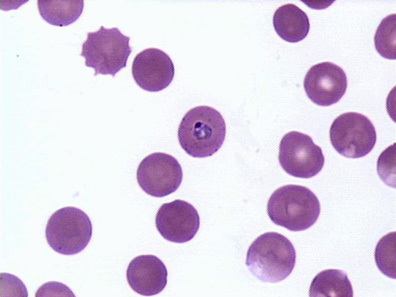 Thus infections caused by P. falciparum can progress to severe, potentially fatal forms with CNS involvement (cerebral malaria), acute renal failure, severe anemia, or adult respiratory distress syndrome. Diagnosis. 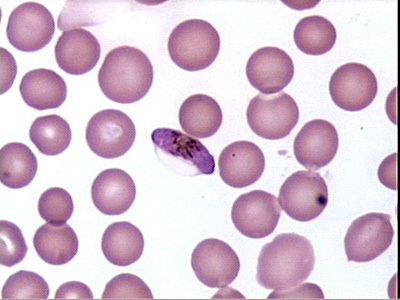 Microscopic identification is the method most frequently used to demonstrate an active infection. Molecular diagnostic techniques can complement microscopy. Antibody test can detect past (not necessarily active) infections. Prevention. Personal protection against mosquito bites is the first line of defence against malaria. In addition, travellers should take chemoprophylaxis where appropriate. 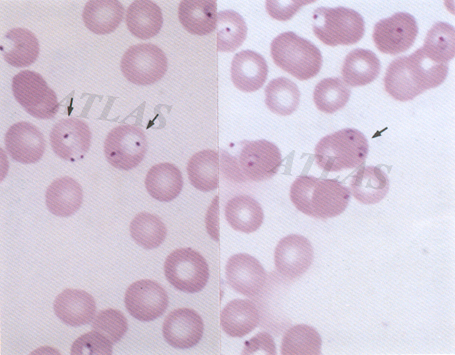 Ring forms of Plasmodium falciparum. 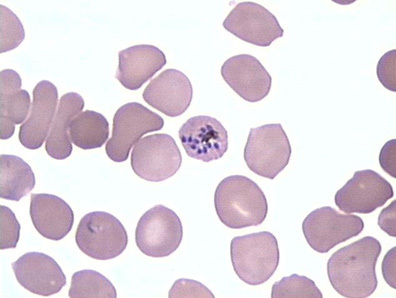 Multiple infection of erythrocytes is common (Giemsa stain, 1000x). 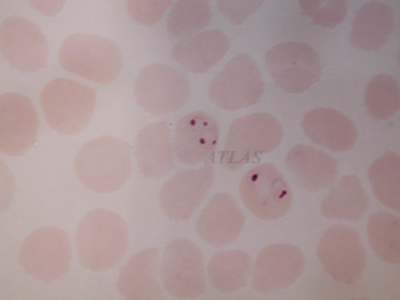 Gametocytes of Plasmodium falciparum showing characteristic banana shape (Giemsa stain, 1000x). 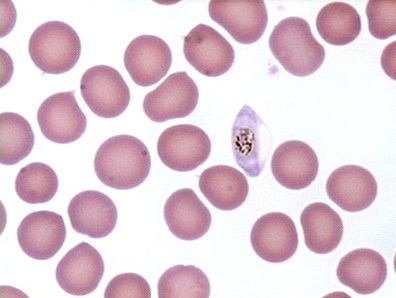 Midgut of a mosquito, which is infected with Plasmodium species. Many zygotes invaded into a abdominal cavity of the mosquito. 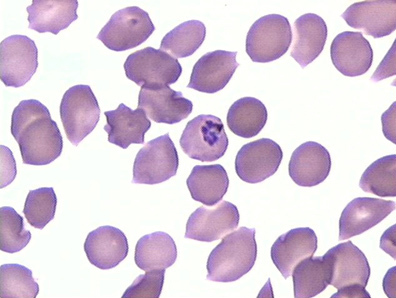 Crescent shaped gametocytes of Plasmodium falciparum. 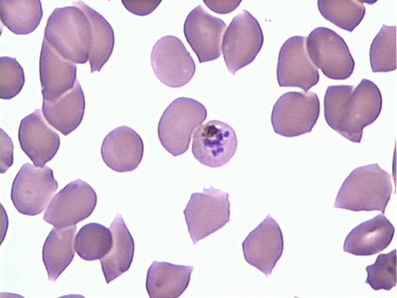 Double infection of Plasmodium falciparum trophozoites in red blood cells.